TWIN OAK “So you’re going out with friends or family and you are trying to think of that perfect place to eat and relax. You know – the place that’s centrally located, got great atmosphere, friendly service, a good selection of craft beers on tap, and great PIZZA! Well your search is over. Twin Oak Wood Fired Pizza & BBQ is that place. Located at the corner of Hanley and Strassner in Brentwood, Twin Oak has a great menu of appetizers, sandwiches, salads, entrees and, of course, pizza – all made with the freshest ingredients. The gourmet pizzas are wood fired to 900 degrees, giving them the most delicious crust and flavor you’ll find. Enjoy a full bar and the big game as you watch all the action – both on the big screen tv’s and in the open and inviting restaurant atmosphere. Check out Twin Oak for lunch or dinner 7 days a week. They are located at 1201 Strassner Dr. Call for pickup or delivery at 314-644-2772 and check them out on the web –twinoakwoodfired.com. 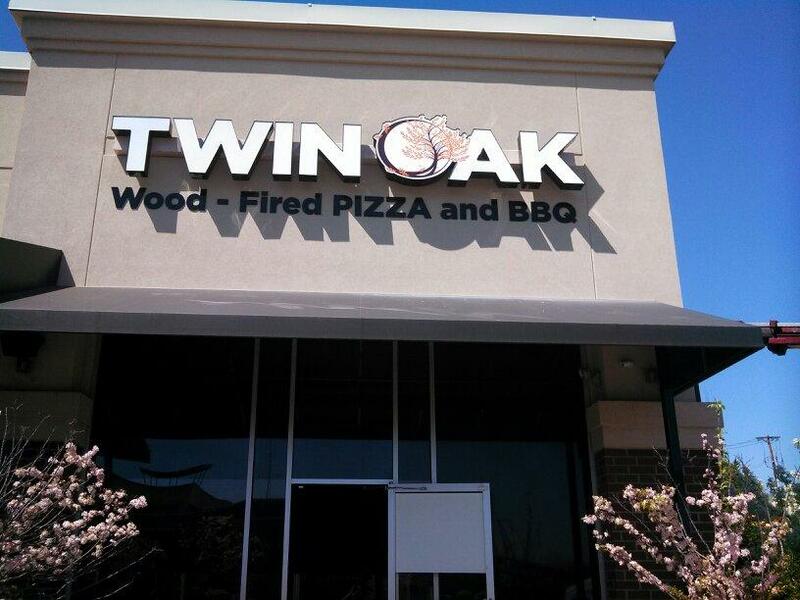 About the signs: You can’t miss “Twin Oak – Wood Fired Pizza & BBQ” if you are travelling anywhere along the Hanley and Strassner area. 3 lighted channel letter signs with unique Oak tree graphics can be seen from any direction. Accented with custom flat cut dimensional letters for “Wood Fired Pizza & BBQ” the signs are tastefully done to help draw people to a great dining experience.